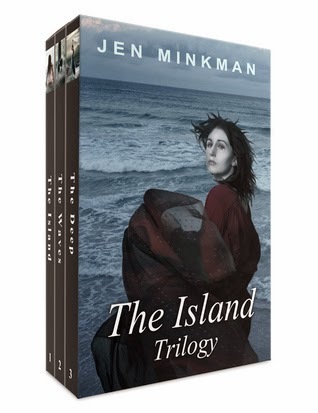 All three books of the Island series in one volume – The Island Trilogy is the perfect young adult dystopian read if you are looking for something different than usual! From the isolated island of Tresco to the wild moors of Dartmoor, this far-reaching tale of lost children, strange belief systems and shattered societies will make you wonder about our own culture, today’s world, and our place in it. How much of that world do we take for granted without asking why things are the way they are? THE WAVES – Walt lives in Hope Harbor, a pious town inhabited by people who patiently waits for the Goddess to come to the Island one day. She will take them away and save them. Or will she? When Walt’s best friend and future leader of Hope Harbor is silenced when he questions the religion of old, Walt sets out and discovers the shocking truth about the island they live on and the people beyond the Wall. THE DEEP – Leia and Walt sail away to the legendary world of Cornwall. They’ve been told that all wars of the past have been forgotten and the people there live in peace, adhering to the tenets of an old religion that preaches forgiveness and non-violence. However, on a trip to Exeter, the ancient city of their ancestors, they discover more about the new world than they ever bargained for. It is very unusual for me to abandon a book partway through but I'm afraid the Island trilogy fell into that minority. I managed to read the first book, but my interest dissipated in book two. I found it difficult to be absorbed by the first book in the series, but somehow I trudged through. It wasn’t the concept that didn’t excite me, I love near impossible adventure stories, in fact my last read was about dragons so you can’t get more crazy than that, but I couldn’t find myself to believe the story like I wanted to. Book one begins with a two siblings leaving their parents home to join the other kids living in the mansion. Once each child has reached the age of ten, they are expected to fend for themselves; and the parents encourage this because it is the normal behaviour. Although I realised that this was a crucial part of the story, it sounded like the kids were playing house. Sorry, but how can every parent bring their kid up for ten years and then say, ‘off with you?’ furthermore, the kids all believe that their parents don’t love them, how on earth does that work because fundamentally even a tiger protects its cub! There might be a handful of adults like these in reality but in this story ALL the parents acted like this, which was beyond unrealistic. The pace of the story picked up once the girl (I've even forgotten her name though I just finished reading it) starts questioning their leader, the power hungry Saul, who is eighteen or nineteen. She uncovers secrets about their lives and that Saul has been lying about the ‘Fools,’ who are mythical people that live outside their ‘wall.’ She panics when she’s about to be caught, and runs into the woods to hide the special Book they live by but stumbles across one of these 'fools.' Just re-reading what I wrote highlights what a joke this story is! Anyway, Walt (who is clearly more memorable than the female protagonist) persuades the girl to meet his foolish people and she agrees. The story finally becomes more interesting once Walt enters, because he adds a bit of much-needed humour. Thanks to Walt’s entrance and because the first book is very short, I managed to finish reading part one of the trilogy. Unfortunately, I can't say the same about the second book. I had expected it to pick up where the last book left off but book two was about Walt's childhood. If I hadn't already 'met' the older Walt, I would wonder what possessed someone to write a book about such a boring child. I got as far as Walt sneaking out to the wall and seeing a lone sheep before I gave up on this series. Perhaps book three is a game-changer, but I really cannot muster more effort to read it. Like I always say, just because I don’t enjoy a book, doesn’t meant the book isn’t any good. The Island just was not my cup of tea. When I turned ten, I became a grown-up. Colin and I joined the rest of the youngsters in the manor house after our birthday. Even in a fantasy world, parents are not to be trusted – the stories of Snow White and Cinderella make that perfectly clear. The mothers in those takes didn’t love their children either.